Often people suffering from psychiatric symptoms are misguided from seeking right help. Clinician from other fields like general physician, neurophysicians, neurosurgeons & now even quacks and faith healers are notorious for prescribing psychotropic (drugs that work on brain). They have an intricate & deep rooted system comprising of touts & middlemen, who traps & guides the patients to their master doctors with whom they have liaison connection & commitment of shared commission. These clinician, due to lack of specific knowledge in the field of mental health science, instead of helping patients, badly harm the patient by disturbing the tender & delicate neurotransmitter balance of mind. Innocent patient are being victimized & cheated in various ways. 13. 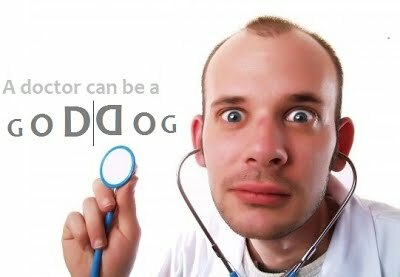 Keeping the attitude of as doctors are God ! Today the truth is psychotropic drugs are prescribed indiscriminately by clinician from other branch of medical science rather than by specialist like neuropsychiatrist. Other clinician treats patients with psychiatric symptoms very badly, with many without actual need drugs & above all without their knowledge & consent. Patient unawareness & poor education about nature of illness is also one the factor. It is the basic right of all patient to know every details of medication prescribed, possible side effects, relative benefit vs. risk & so on. If you are advised investigation especially costly & invasive procedure like ultrasound, CT or MRI scans, battery of blood test, you should ask your treating clinician the rationale of using such so many tests & drugs. 1). Are these multiple test or drugs are really going to yield diagnosis ? 2. Going to make you rich by your back door of contract of commission ? Now this is not hidden that often there is a connection of treating clinician writing many unnecessary investigation deliberately with pathological laboratories & scan centres to make money. Prescribing many medications without actual need have become common trends of almost every doctor. Those who are more popular are more involved. Dispensing too many medicines increases the sale of medicine that in turn yield more money in form of commission. Clinician from medical field prescribing psychotropic without patient consent & knowledge are endless. They may be your general physician, neurosurgeon, neurophysician and so on. Some even visit quakes & faith healers. Over the counter (OTC) abuse of psychotropic is also common. 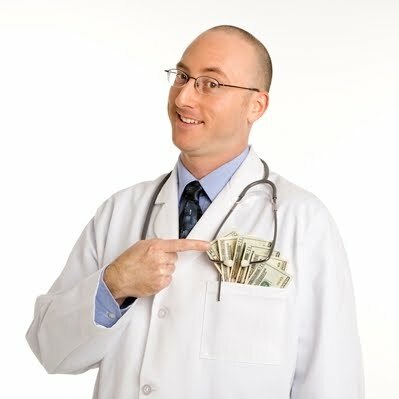 Often people suffering from psychiatric illnesses are being treated as soft target for making easy money by doctors. It is because the chronic nature of the mental illness & non-fatal outcome in most of cases. Psychiatric symptoms arising from mind are often misinterpreted as grave by lay population. Due to unawareness, common people remain in confusion whom to visit. Family members become apprehensive & panic stricken,when psychiatric symptoms affect their beloved one. Also, the state of suggestibility surmounts rapidly leading to wrong selection of clinician. Even in this modern age of medical care & with high education level, people suffering from psychiatric illnesses, visits faith healer (tantriks, ojhas, guni, sadhus, babas, jhad-phuk walas, jadi-buti walas etc.) & quacks. Those who didn't get trapped in the net of faith healers & quacks, are lucky enough to contact primary care physician who mostly have the degree of mbbs. Despite correct identification of psychiatric illnesses, most primary care physician, instead of referring the case to a neuropsychiatrist, treats the case according to their level of skills. It is only after several month or years of treatment or when the case become complicated, they refers the case to get rid of patient. Touts & middle men plays a prominent role in guiding the patient & their family members to a particular doctor of mind. In India, it is common trend to consider neurophysician as all rounder. Any type of illness with symptoms emerging in mind are treated by neurophysician. Out of 10 patient suffering from depression, 6 patients, by hook or crook, goes in the pocket of neurophysician. Of rest 3, one or two will visit neuropsychiatrist on their own, other wise neurosurgeons also remain ready to treat person suffering from depression. Simply, today the harsh reality is that, a person suffering from psychiatric illness visit psychiatrist years after onset of symptoms and after being maltreated by faith healers, quacks, general physicians, neurophysicians and neurosurgeons. One good news about psychiatric illnesses is, it can be dramatic, emergent & appears grave and fatal, but does not kill the patient. So there is no need to be in hurry in cases of psychiatric diseases. WHEN TO VISIT NEUROSURGEONS ? If you have sustained a head trauma with collection of blood in your head or have developed a head tumour that need immediate surgical removal, you should immediately consult a neurosurgeon preferably those with MCH qualification. They will operate on your brain to lower raised intra cranial pressure. Any surgery over the brain should be operated only by neurosurgeons & not by general surgeon, neurophysician or neuropsychiatrist. If you are suffering from long term sadness of mood, insomnia, suspiciousness, fearfulness, nervousness or any symptoms of mind having no organic basis, visit neuropsychiatrist rather than neurosurgeon or neurophysician. As you know, most of the surgery of brain are risky & complicated. Prominent neurosurgeons are reluctant to handle their proper cases requiring immediate neurosurgery for example head trauma after road traffic accident or a deep seated brain tumor requiring immediate surgical evacuation. Such cases either dies on the spot or get admitted in luxurious multi-specialty hospital to be further victimized. Sometime even a dead person are kept in a high dependency unit like ICU, NICU & intervened unnecessarily. These are dirty business skills to raise the bills of victims & to earn money. They are well flourishing by treating the patient suffering from psychiatric illnesses & treating them in a very shrewd manner. It is only after several year of treatment, the patient came to know that they are devastated due to treatment & then they seek help from psychiatrist. We request to all those person being treated by neurosurgeons to evaluate the problem you are suffering & to ask a question to your treating surgeon, does it need surgical intervention like opening of brain under general anesthesia ? WHEN TO VISIT NEURO-PHYSICIANS ? If you are suffering from neurological illnesses, definitely visit neurophysicians for help. But in reality, the story is worse & shameful with neurophysicians as is with neurosurgeons. Instead of treating core cases of neurology requiring their help (like epilepsy, stroke, dementia, encephalitis, meningitis, multiple sclerosis, Parkinson's disease, Alzheimer disease, motor neuron disease, muscular dystrophy & other degenerative brain disorders etc. ), they are well thriving by deceptively treating pure cases of psychiatry. If you seek their help for even minor complain of sleep difficulty due to recent job loss or marital disharmony, be ready to bring CT or MRI Brain Scans & other costly investigation of brain, as soon as possible. As an innocent & poor patient turn blind follower, you even can't dare to ask rationale for these costly investigations, because you use to remain in hope of cure. Some neurophysicians own brain imaging center or have relationship with brain imaging centers that can be reason for indiscriminate ordering of costly brain scans. Not only this, it seem that they have got licensure (but in reality, this is unethical) for indiscriminate use of multiple psychotropic without patient knowledge. Your precious brain is being used by them as that of guinea pig or experimental animals, with no concern for regarding grave & ever lasting disturbance of delicate & fine balance of neurochemicals & neuro receptors. We request to all those person being treated by neurophysicians with lots of psychotropic, to ask many question regarding nature of illness, prognosis/ fate of illness & relative benefit of treatment & at least how long treatment will go on. WHEN TO VISIT GENERAL PHYSICIAN ? If you are suffering from general medical condition like pneumonia, gastroenteritis, etc., undoubtedly you need a consultation with a physician. 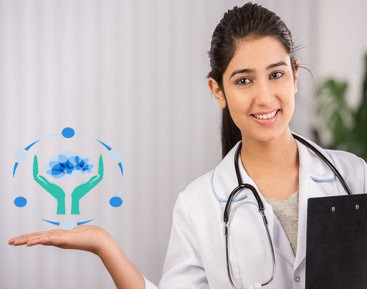 Patients with various complaints visit general physician who mostly have the qualification of only MBBS & also the first contact with medical service is often by visiting general physician. This first opportunity to handle fresh cases & inadequate knowledge as compared to specialist, are two big factor for maltreatment & consequent future suffering of innocent patient. Today, anyone can say with confidence that a general practitioner prescribes medicine without actual need. They loot the patient by deliberately writing medications as much as possible on a single prescription. The underlying motive is to increase the budget of medical care & to earn money in the form of commission. Alprazolam (a benzodiazepine drug that is habit forming) is very popular among general physician. They prescribe this particular drug for almost any illness with the symptom of sleeplessness & restlessness. Today alprazolam addiction is in the form of epidemic & general physician role in spreading this epidemic is prominent. There is similar story with morphine group analgesic drug Spasmo-proxyvon. Many country side physician prescribe Amitriptyline as a sleeping pills, but they even don't know the class & function of this particular drug (You can make a survey for this on your own). If you are being treated by your general physician with drugs altering the delicate neurotransmitter balance of mind, you are running the risk of being treated by a non expert & in-experienced of mental health science who can badly scar your brain for ever. WHEN TO VISIT NEURO-PSYCHIATRIST ? Psychiatrist are doctor with qualification of MBBS & MD in Psychiatry. They are specialist in the field of mental health. Dealing with the functional problem of brain is their area of expertise. Brain the most precious organ of our body, lying over the top like a crown, it controls almost every bodily functions of human. It is really not surprising that if one says constipation & hyperacidity of stomach, pounding heart beat etc., are due to your excessive worries. Off course fearfulness, sadness, suspiciousness, nervousness are the symptoms that do not arise in your liver, so there is no need to visit a gastroenterologist for the same. Instead, if you are tired of being treated by your gastroenterologist or cardiologist for recurrent hyperacidity or palpitation, consider psychiatric cause for your symptoms. There is no need to visit a psychiatrist, if you have developed fever & infection, high blood pressure, head trauma requiring surgery over brain or any illnesses with definite identifiable cause in body. WHAT IS THE DIFFERENCES BETWEEN A PSYCHIATRIST & A PSYCHOLOGIST ? The most basic difference between the two is that a psychiatrist is a registered medical doctor who can prescribe medication to the patients while a psychologist is not. Psychiatry is a branch of medicine that specializes in curing mental health disorders using medication if necessary. A psychiatrist goes to a medical school and will spend at least 5 years working in physical medicine to acquire the degree of MBBS than 3 years working in neuropsychiatry to acquire the degree of MD. It is after this at least 8 valuable years of intense studies, a psychiatrist get licensure to prescribe psychotropic to patients. In contrast, psychology focuses on formative influences that determine a person's behavior such as their emotional history and sociological background. A psychologist will help patients understand their actions and reactions so that they may modify their behavior to reduce distress. A psychologist starts his or her training with a psychology degree and goes on to higher studies but has no medical background. Always remember, they are not doctor & they don't have the right to prescribe medications. This is also true that, due to scarcity of time, most of the psychiatrist are unable to provide psychological therapy in addition to psychotropic drugs. But it does not mean that psychiatrist are not aware of different psychological therapeutic methods. Most of psychiatrist today works in liaison with a clinical psychologist as many psychiatric illnesses requires behavioral therapeutic methods. 3. If a person suffers from a psychiatric illness requiring prolonged treatment, it become a matter of shame & unacceptable to society; but if a person develops high BP, high blood sugar, incurable liver or kidney disease requiring life long treatment, the whole society attitude is more supportive. Why ? 6. Visiting psychiatrist to receive proper treatment is still ignored & avoided by general population, but taking the same psychotropic drug from clinician from other field is not objected by any one. Underlying factors are stigma attached with psychiatric illness, ignorance & unawareness of common population & above all fraudulent behavior of clinician from other branch of medical science to make easy money. 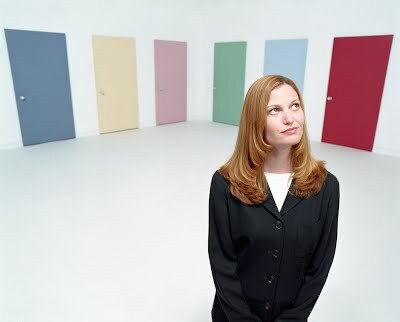 when so many doors are Open - what to do ? where to go ? whom to visit ? Please don't go in panic. Psychiatric illnesses are not going to kill you. Apply your brain. Identify & analyze the signs & symptoms of your illness. Awareness & education about nature of illness is best & most basic weapon to deal with. Google is vast source of information to give elementary knowledge about any illnesses. 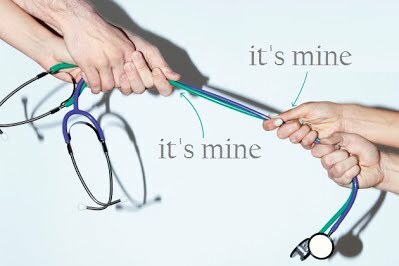 Choosing the right clinician for your illness, is in your hand. Please don't be guided by touts, names, popularity and bright & tempting polish of any clinician. If you have pain in bones, visit orthopedics rather than hematologist. 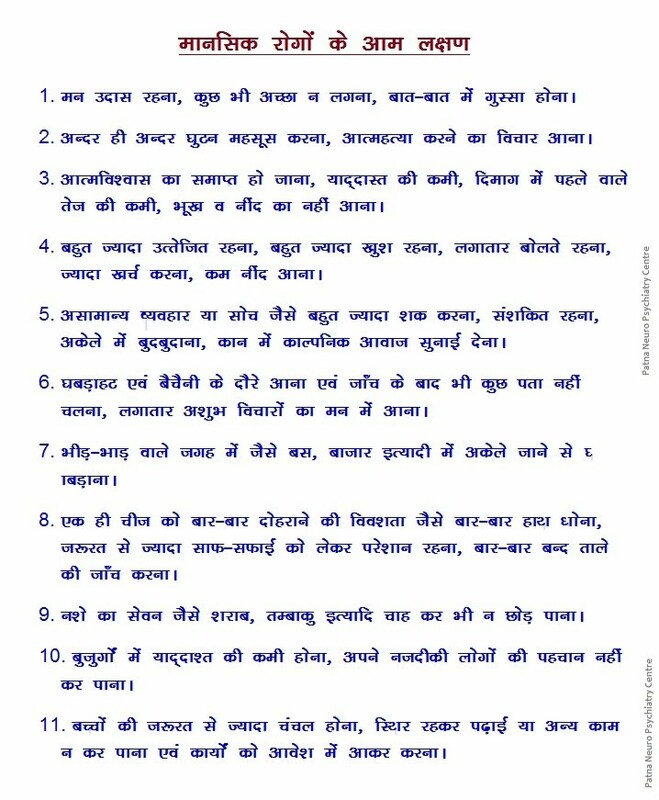 To clear your doubt & to prevent you from further victimization regarding maltreatment for your psychiatric illnesses, below is the list of few early & main symptoms of psychiatric illnesses in Hindi. Although the list is not complete, but quite helpful for general population. If you or your close one is suffering from any of the symptom with significant impairment in social & occupational life, you should contact your nearest psychiatrist at earliest. There is no need to visit clinician other than psychiatrist.